The search phase is about meeting the world with curiosity and interest. It is about actively gathering data with the intention of transforming it into new ideas, scenarios, concepts and strategies for the future. The word search is rooted in the Latin word circare meaning to go around. When we search we are going around the situation in order to understand it better. We search in the situational context to identify artefacts, narratives and behaviors related to the situation, and to assess their potential for making change. We call our observations signals, because they are signals of potential change. In searching we distinguish between two sub phases where we scope the search and scan for signals. When scoping, we aim to define where to search for signals of change. Scoping is the creation of a strategy for the search, and making sure to cover all chosen areas of interest. 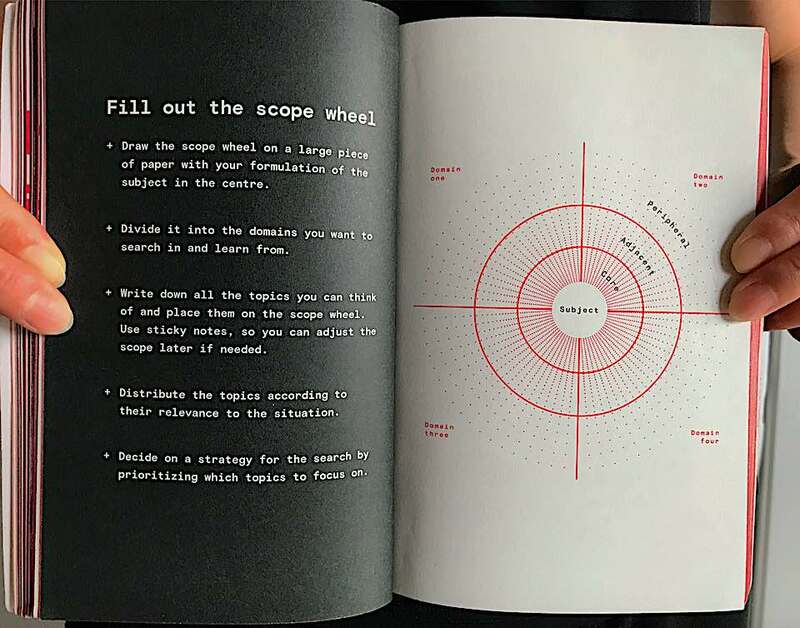 The scope serves as an action map and guiding compass for scanning. Scoping aims to identify domains related to the situation, and help searching for topics within these domains, that can share perspectives, judgements, ideas and knowledge related to the situation, and use this as a guide for where to scan for signals. The main objective of scoping is the articulation of current knowledge and topics related to the situation. We distinguish between three types of knowledge, known knowns, known unknowns and unknown unknowns. We use what we know, and our curiosity to guide us into the unkwnon. Known knowns (15%) What you know, you know. Known unknowns (25%) Wha you know, you don’t know. Unknown unknowns (60%) What you don’t know, you don’t know. We use a model that we call the scope wheel to visualize and work with the scope. We divide the context of the situation into a few domains of interest and aim to exhaust each domain with topics more or less relevant to the situation. 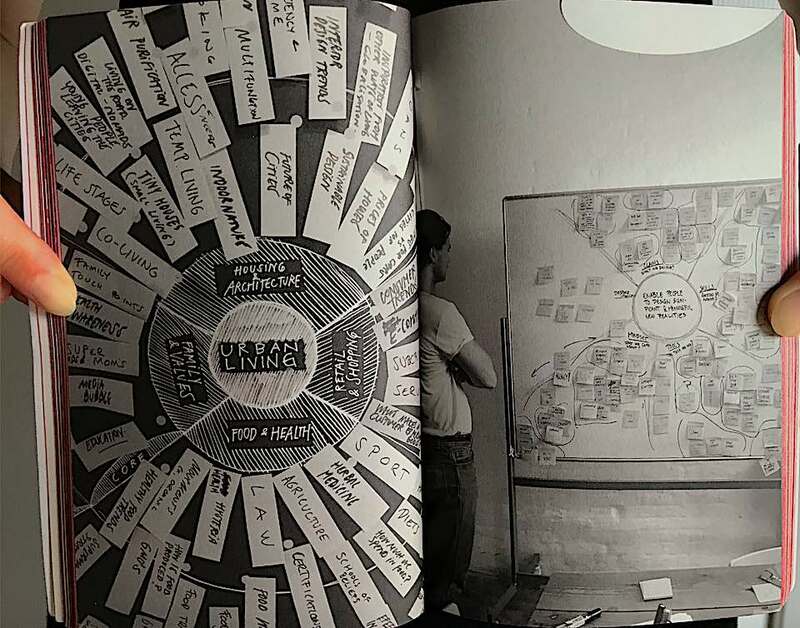 The domains of interest serves to focus our search on what will most likely change the situation or where we find the most potential for inspiring our design process. Keywords from the situating phase can serve as a basis for deciding what domains are most important. To inspire a wider search, models like the business analysis framework STEEPV can be used. Each letter of the STEEPV will constitute one domain and we fill out each of them with topics relevant for the situation. The STEEPV domains: Social, Technological, Economical, Environmental, Political and Value-based issues. Closest to the core of the subject and at the centre of our scope wheel we find the topics most relevant to the situation, and closer to the periphery the topics are less relevant. Outside the periphery are those topics we deem irrelevant to the subject of study. 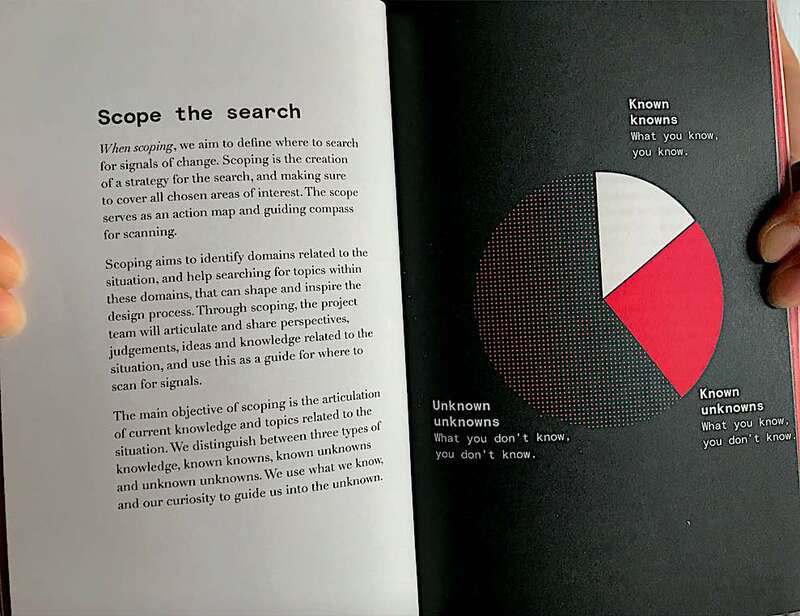 In-between we define three spaces to guide and calibrate our search strategy.